Because it seems Camera Critters has evolved into a WEEKEND activity (rather than a Sunday one as I first believed) ... and because the Saturday 9 questions don't 'move me' to respond today, I'm opting to post mine now. Meet the friendly Chocolate Lab that kept me company last summer in Hensington Gardens ... inviting me to put down my pencil & paper to play ball often, but meandering off to play with others once I picked it up to write again. Click for others participating in Camera Critters this weekend. 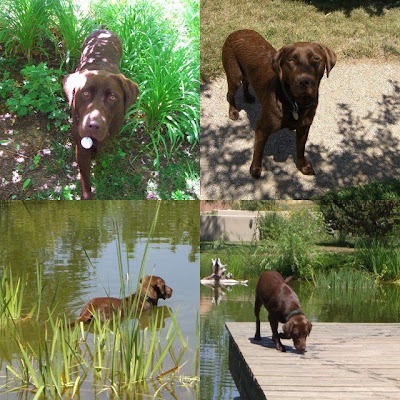 Cool pictures of your Chocalate Lab, my son has one named Fudge. Great photos. I enjoyed my visit here today as I do every time I visit.Big Time Hugs and God's blessings comming your way from me. That's my story and you can bet I'm sticking to it. Nice photo mosaic of your dog. Isn't so much fun to take their pictures? I know my Chloe is very photogenic as well. Congrats on the shipment of your new computer always a fun treat - new toys. So pretty, I love anything chocolate! Great news about your laptop. Love the pictures of your lab. How could you resist those eyes??? I would have done the same thing I think! I love the photo at the top of the duck and babies - wonderful reflection. Yay for the computer news !!!! I love the dog shots and the ducks with the kiddies ta the top is tyhe cutestt. 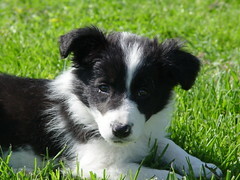 What a beautiful dog. The duck shot at the top is fantastic! I love how the ducklings ride on mama's back. She actually looks like she is smiling. What a friendly little bugger! I love labs. We have a yellow one (really more white) who LOVES water and loves everyone and would lick anyone she meets. Glad your new computer is on it's way! How exciting!! Nice pictures of your visitor! Labs are such sweet dogs! Beautiful collage. I love the quote which is great for the OSI theme today too. Other than my Willie, Chocolate Labs are my favorite! Great shots, all! Fishing Guy – That’s a great name for a Chocolate Lab. Actually this one isn’t mine … I simply encountered him in Taos, NM last summer. Mike – I’m glad you’re able to visit again now that I’ve rearranged things. I appreciate your visit and the links you left to yours. Tammy – I agree. When I found Molly, I was looking for a chocolate … but the Universe presented me with her … and I couldn’t resist. Lapa37 – Yes … labs LOVE to play and are fun to interact with. Me & My Puppies – I’m chuckling and thinking about sweet chocolate things … grateful I don’t have any in the house to tempt me as I type this. Misty Dawn – I agree … and it’s always fun to let doggies draw us into their play isn’t it? Methinks your reasoning is quite sound. I ended up using the two days this week to ‘catch up’ after missing the first week of Camera Critters way back when by posting Sunday too. Leechbabe – I’m definitely relieved the delay in delivery won’t be an extended one and I’m hoping it will arrive EARLY tomorrow. LingoVise – I’ve had dogs in the past avoid water like the plague, but my Molly finds water to lay down in wherever we go and loves to play in the surf at Dog Beach. I posted a collage of beach photos with Molly on a Fun Monday post about ‘a favorite walk’ a while back. Carletta – I’m glad you enjoyed all the photos here. Corey~living and loving – This Chocolate Lab was even friendlier with strangers than my Molly … who’s a little shy for a Lab. Babooshka and Rayne I was delighted to discover the duck photo at Flickzzz a while back and am happy to share here. Rhea – Your Lab sounds a lot like my Molly who’s also a ‘Yellow’ by breed … but almost completely white in color. She’s been featured in earlier Camera Critter posts and clicking on the label Molly underneath this post will take you to those. I can hardly wait for the new laptop!!! Gretchen – Definitely … and he kept dropping a tennis ball at my feet so how could I resist throwing it? Sharon – Thanks … I love Labs too. Sandy (I beati) – Glad you enjoyed the quote along with the dog pictures. I try to end each post with one. Raven – Thanks … I need to check the OSI theme for this week because I don’t know what it is. I’ll probably post mine toward mid-week as I usually do, but I’ll keep this quote in mind as I do. To all – I hope you’ve had a wonderful weekend. I appreciate you spending a bit of it with me here at Small Reflections. Sandy – This Chocolate Lab was great company for me while I was in Taos, especially because I was missing Molly. The garden where he hung out was an especially lovely place to photograph … and in which to sit and write. I hope to return some day. Thanks for dropping by. I’m sorry I’m behind at Momisodes, but you know I’ll catch up ASAP. Right now I’ve got to turn off my new Dell and get to my PSE6 class or I’ll be late. Practically at home – Yup, you’re right about that! Looks like you left your comment as I was leaving my response to everyone else and I overlooked it when leaving a response to Sandy, but I’m happy to notice it and respond today. Thanks for leaving the link to yours here. I love labs! They are the greatest dog, the greatest companions! These photos are beautiful! Tina – Labs are great dogs and I do love my Molly. I’m glad you enjoyed the photos. I have no idea why your comment showed up 3 times, but it made me smile … and that’s a good thing always. Thanks for catching up this way. It’s been fun revisiting last week’s posts with you.